If you're looking for a better way to model and teach your fifth graders revising and editing, mentor sentences are the perfect tool. These pages students take the grammar concepts they are learning about and apply it in their own writing, right away. CCSS.ELA-Literacy.L.5.1.b Form and use the perfect verb tenses. CCSS.ELA-Literacy.L.5.1.c Use verb tense to convey various times, sequences, states, and conditions. CCSS.ELA-Literacy.L.5.1.d Recognize and correct inappropriate shifts in verb tense. CCSS.ELA-Literacy.L.5.1.a Explain the function of conjunctions, prepositions, and interjections in general and their function of particular sentences. CCSS.ELA-Literacy.L.5.3.a Expand, combine, and reduce sentences for meaning, reader/listener interest, and style. 13. Use short sentences with long sentences to draw the reader’s attention. CCSS.ELA-Literacy.L.5.2.a Use punctuation to separate items in a series. * This includes commas to separate nouns, verbs, present participles, infinitives, subordinate clauses, and the use of semicolons to separate larger phrases. CCSS.ELA-Literacy.L.5.2.b Use a comma to separate an introductory element from the rest of the sentence. CCSS.ELA-Literacy.L.5.2.c Use a comma to set off the words yes and no (e.g., Yes, thank you), to set off a tag question from the rest of the sentence (e.g., It's true, isn't it? ), and to indicate direct address (e.g., Is that you, Steve?). CCSS.ELA-Literacy.L.5.2.d Use underlining, quotation marks, or italics to indicate titles of works. 11. Use of quotation marks to indicate titles of works. *(I have included pages that include the Oxford comma as well as pages that omit the Oxford comma, depending on your preference. Although this brings the actual page count higher, I’ve lowered the price accordingly). CCSS.ELA-Literacy.L.5.1.a Explain the function of conjunctions, prepositions, and interjections in general and their function in particular sentences. CCSS.ELA-Literacy.L.5.4.b Use common, grade-appropriate Greek and Latin affixes and roots as clues to the meaning of a word (e.g., photograph, photosynthesis). CCSS.ELA-Literacy.L.5.6 Acquire and use accurately grade-appropriate general academic and domain-specific words and phrases, including those that signal contrast, addition, and other logical relationships (e.g., however, although, nevertheless, similarly, moreover, in addition). CCSS.ELA-Literacy.L.5.5.c Use the relationship between particular words (e.g., synonyms, antonyms, homographs) to better understand each of the words. CCSS.ELA-Literacy.L.5.5.a Interpret figurative language, including similes and metaphors, in context. 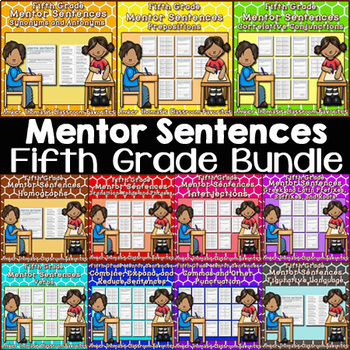 * Mentor Sentences worksheets: Each worksheet has 2 Mentor Sentences for students to analyze and compare, and room to write their own. * Definitions and Examples boxes: These can either be glued onto the page itself or into an Writing/Editing/GUM notebook as a study guide for future reference. These come 8 to a page in order to conserve copy paper. Disclaimer: Any claims of correlation or alignment to the CCSS are solely those of Amber Thomas and have not been evaluated or endorsed by the NGA. Amber Thomas is the sole creator of this product and does not claim endorsement or association with the creators of the CCSS.